There’s something so attractive about pub quizzes: here’s an opportunity to enjoy a few beers with friends adjoined to the very exciting possibility of being able to show off your arcane knowledge of ’80s pop music or South American butterfly genera. The competitive edge adds a certain frisson to the evening while everyone knows that whether they win or lose, it was all only a bit of fun anyway. And best of all, it’s for charity so those beers are entirely guilt, if not calorie, free. Siem Reap’s expatriates, rumoured to like any opportunity for a beer, but especially a guilt-free one, have contrived to create five pub quizzes in town that are open to anyone with the $1 entry free and a willingness to join in the fun. At 20:00 every Thursday night the longest standing quiz used to be held at the Funky Monkey but has now transferred to The Warehouse beside Old Market. This one tends to be the toughest too, and the challenge for all visitors is to beat habitual winners ‘Paddy Power’. The questions cover a broad range of topics so there’s plenty of opportunity for everyone to have a moment to shine in the glow of getting at least one answer right. 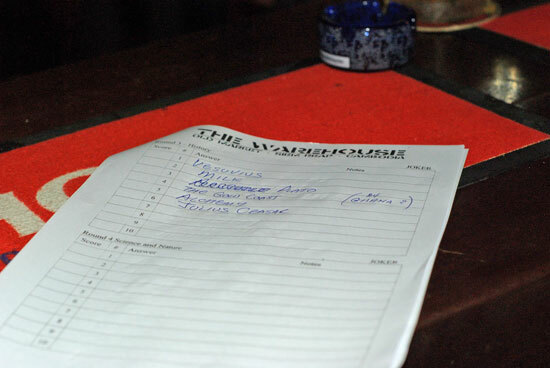 Also at The Warehouse on the first Saturday of each month is a chance for music nuts to major with the Music Pub Quiz. Topics roll through the decades starting with the ’60s, and picture and music snippet rounds are also included. Then at last there is a series of quizzes that are really only one, though held at three different venues. Roughly, the quizzes are held at Rosy Guesthouse on the first Friday of each month, at Fresh at Chilli si Dang on the third Friday, and at Molly Malone’s on the second and fourth Fridays. This quiz is a little bit easier than the Warehouse one and the atmosphere is a lot lighter too. The infinitely entertaining Quizmaster Mac is the host, and prizes are promised for the nights the quiz is held at Molly Malone’s. ... because the truth is out there. 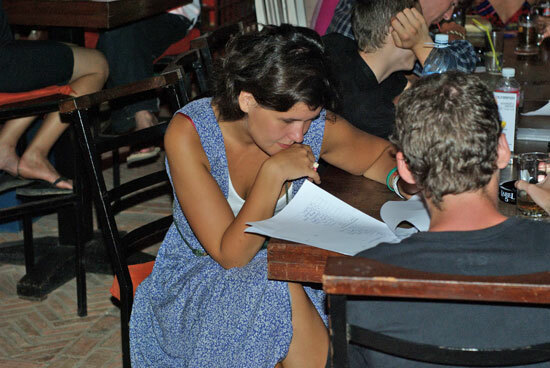 All of the quizzes in Siem Reap are held in support of local charities. These tend to be drawn from a small pool of NGOs that focus mainly on supporting Siem Reap’s children although the Women’s Resource Centre also participates.